Casa Alerny is a vineyard for production of wine and olive oil from the 15th century, which is now reformed and let out as a holiday home with swimming pool. The surrounding wine- and olive fields are still cultivated by the Cedo-family, who now live in Barcelona. The harvest is sold to some of the big and famous producers in the nearby Priorat district. The beautiful view over the vineyards, the olive trees and the impressive mountains La Serra de Llaberia in the horizon can be enjoyed from the extensive terrace and from the pool area. The house is privately situated on the top of a small hill and with only 600 meters walk to the village La Serra D´Almos. The house has 4 double rooms (8 persons) included in the price, which have own bathrooms and are situated on the main floor of the house. 3 addtional bedrooms and two bathrooms are available for bigger groups on the second floor. The price per extra bedrooms is 200 Euros/bedroom/week. Distribution of the house: You enter the house from the charming courtyard by a stairway to the main floor. To the left, the 4 double rooms are distributed on both side of the aisle, three of them with bathrooms ensuite. To the right, you find the modern kitchen with dining area, and if you go straight on, you enter the enormous living room with dining area, TV-corner and fireplace. There is a great view. From this room, you can enter the very extensive terrace with a covered part, in case you prefer shadow. There is a BBQ available and also a table tennis. The terrace gives a very authentic Catalan atmosphere. From the terrace, there is a stairway down to the pool area. You will need to pass a gate, so it is very secure if you bring small children. The pool area is a very nice place to relax in the sun loungers, and a great place for the children to have fun. On the second floor, there are three additional bedrooms, which can be let as well, to extend the capacity to 14 persons. Lisbeth and I (Bertel) are the owners of the company SYDENS FERIEHUSE. For the last 14 years we have engaged in letting out fantastic Catalan holiday homes, all of which live up to our criterias: they are authentic, charming homes and are all of a very high standard. We now let out more than 400 beautiful holiday homes, and some of them are advertised on HomeAway - We help Salvador and his family let out CASA ALERNY. The areas main attraction is the entertainment park Universal Studios Port Aventura. It consists of an aqua park and an amusement park, which can be visited together or separately. If you let the kids decide, you can easily spend 2-3 days here. From the artistic point of view, there are not many places that have such a large number of monuments and tourist attractions concentrated in such a small area as Tarragona has. Its most notable landmarks and tourist attractions are the Roman Amphitheatre in Tarragona and the Cistercian monastery in Poblet, as well as many other places of interest within the capital city, just to mention some examples. The Costa Daurada shoreline is comprised of a total of 13 municipalities, which, over a stretch of 92 kilometres, offer some sixty different beaches in all shapes and sizes from the small. Several of these beaches have been awarded the blue flag by the European Foundation for Environmental Education. Catalonia: Discover the Catalan soul in a historical, carefully preserved but modernised country house. In comfortable distance from the crowded beach resorts, but still with the metropolis Barcelona, lively historical towns as Girona, Tarragona and Vic and the natural parks in The Pyrenees within short reach. We offer vacation in your particular pace, where you blend in with the open-minded and friendly Catalans. Enjoy the silence in the small hills in the pre-Pyrenees. Enjoy sports and outdoor activities as walking, canoeing or mountain biking. Or scamper about in the lively street- and café life in the Catalan towns. Here you will discover gastronomic, cultural and artistic impressions that sticks. As something new we can also offer apartments i Barcelona and many more are coming. There is a bakery in walking distance in the nearby village. Enjoy the warm croissants, if you have a person in your group, who likes an early walk. Stay in a former winery, now a modern but authentic holiday home for 8 + 6 persons, sitauted on the border to the Priorat wine district and with the Costa Daurada beaches only 15 minutes drive away. 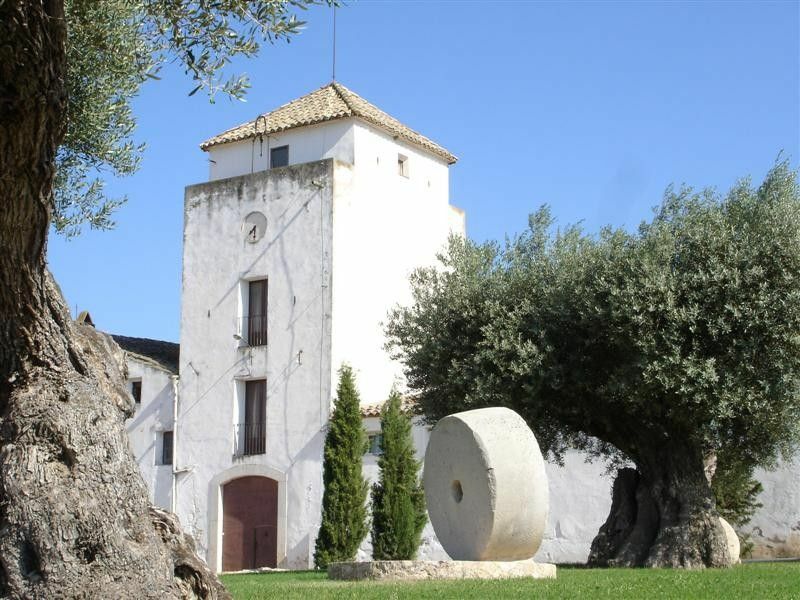 The house is ideal for as well peaceful relaxation as well as excursions, for instance to the historical towns of Tarragona and Reus, the beaches of Costa Daurada, the wine districts Priorat and Penedés and the natural park of Delta del Ebro with the Flamengos. You can also take the child-friendly bicycle ride on 'via Verde' on a former railroad and if you want to spoil the kids, the Universal Studios Port Aventura is an obvious excursion. If you want to visit Barcelona, you can get there in about 1,5 hours, depending on the traffic. We have made an activity document for the area, for your further inspiration. Special for this house is that they have three extra double rooms at the first floor, which are closed but can be opened against supplement (200 Euros/week/double room), if the group is larger than 8 persons. 8 persons are included in the price. 3 extra double rooms are available against a supplement of 225 Euros/bedroom/week. Price includes: National taxes and VAT, electricity, heating, water, bed-linen, towels and cleaning at departure. Not included: Catalan tourist tax: € 0,5/adult (+16) per night. PLEASE NOTE: At Catalan holidays in low- and medium season supplements may apply.